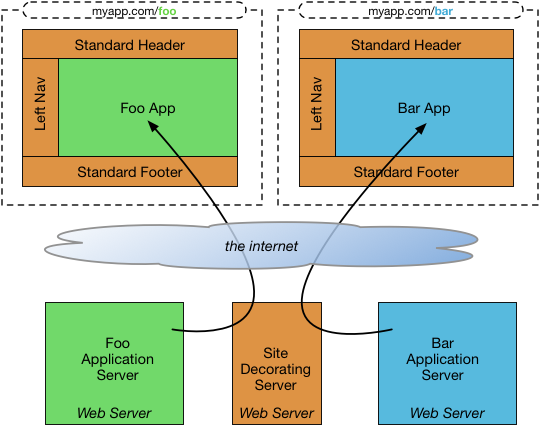 I previously wrote about decorators for web pages and whether they worked on a pull or push basis. That article was confined to decorators that worked on HTML markup in its textual form. These were implicitly server-side technologies. To recap, one technology that was talked about was the legendary Sitemesh (“site-mesh” - Siri pronounces this “sit-e-mesh”, sigh) component by Joe Walnes. I’ve also recetly written about How Google makes a consistent top-navigation across multiple apps. That is in the same area of concern, though not exactly decoration. It turns out Google did site-experience stitching on the server side too. 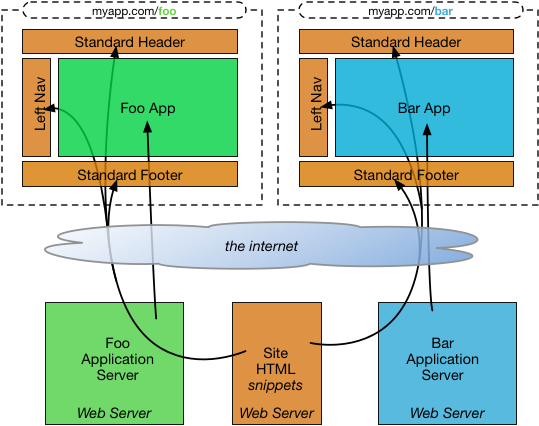 The Sitemesh servlet filter took whatever the intended app page was, and decorated it before sending it to the browser in a single piece. It also worked well for static content. The applications themselves were often in the same webserver, but I’m showing different web-servers that Sitemesh supported. It supported different technologies like Perl, or PHP. As Google did for a site experience for multiple apps? Each app was its own web server, but snippets of site experience were injected into specific parts of the page. The research I on this did before was really only about the top nav, but the design is the same for multiple injectable parts of page. I’m showing above that the “site experience” as being pulled in via HTTP request a sideways web server, but I really don’t know for Google. It could have been a library function as easily meaning the technology was effectively linked in at build-time. Smart caching of those rectangles per-user on the server side makes it fast either way. Maybe, though, you’re not in the habit of serving up the main encompassing window too many times a day (per user). The app’s main page loads, and then pulls in as many further “site” rectangles as needed. The browser handles caching for the rectangles, so timeouts should be chosen carefully. This could be injecting into empty DIVs with the page. It could also be a design that leverages iframes. It is determined that site “decoration” is needed, and then applied. Present page to the end user - phew! What’s not possible is that you can block the first showing of the page before it gets decorated. Or maybe you can block it, but that’s not going to be easy or smooth. There’s certainly no W3C way of paticicipating in the page load-cycle that way. Yet, at least. In lieu of that, frameworks like AngularJS use a cloaking technique to get there. This isn’t perfect, and experience DOM developers would point out the age old love/hate relationship with iframes at the center of that imperfection. It’s not going to feel quite right in use, because of focus issues. Also the inner iframe and the outer non-iframe don’t share the same URLs. More on that later. What would Joe do today? Client side decorating, of that site experience, isn’t going to please the Google search crawler or their search-preview bot. You have to really worry about latency and brittleness, if you’re going in that direction. Blocking/cloaking needs to be implemented, at least until it becomes W3C standard, unless your whole production setup is so fast nobody notices. If your community is logged in users, rather that reddit-clicking guests, then maybe they are more forgiving about the experience, and more likely to avail of the cached elements too. Then there are the focus and URL issues that are bigger or smaller based on which of the client-side solutions you choose.